For most of us, warm weather is here! Once the days start getting longer and the sun gets a little brighter, I tend to pull out my crockpot less and lean towards cooking for a lighter palate. This recipe stems from being tired of chicken or red meat for dinner. Lately, I've been incorporating a fish meal a least once a week, if not twice with a sautéed shrimp salad for lunch. Zhoodles aren't new to the culinary scene, but I still find it refreshing to cook with them and the starchiness of the zucchini leaves me feeling very satisfied. The Greek tzatziki sauce is a MUST for this dish - fresh dill would make it perfection, I just didn't have it on hand. This specific recipe is whole30 but it could be adapted to fit all different preferences. Cherry tomatoes or roasted red peppers would be a great addition and I usually make a side of basmati rice for Paul with this dinner. I served this two nights ago for my family and my 18yr old brother even liked it which means it is sure to make most happy! And finally, the best part of this dish is you only use one large pan to make the entire thing. The sauce could be made ahead and used throughout the week on anything you please. Recipe is at the end of the post, enjoy! 2-3 Zucchini - store bought zhoodles or make them yourself with a sprirulizer. 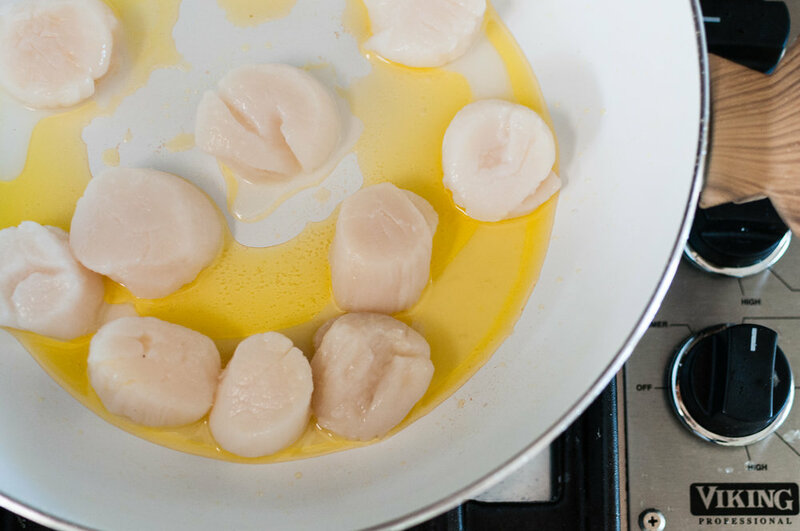 Place the ghee in the sautee pan, along with the thawed scallops on medium heat. Season with salt, pepper, and juice from a full lemon. Allow to brown for 5-7 minutes, flip and cook for an additional 5 minutes until cooked through. While the scallops are cooking, combine coconut milk, mayo, garlic seasoning, juice from half a lemon, dill, and shredded cucumber in a small dish - mix well. Place scallops to the side and add the zhoodles directly to the pan, leaving any remaining ghee or seasoning in the pan - cook for only a few minutes until soft - toss occasionally. Place zhoodles on a large platter, top with scallops, drizzle tzatziki dressing on, and finish with juice from half a lemon (if desired).